Manufacturers of cordless drills generally recommend a battery charging time of three hours. Once the charging time is up the battery must be disconnected from the charger: if you forget to do this there is a danger of overcharging the battery. 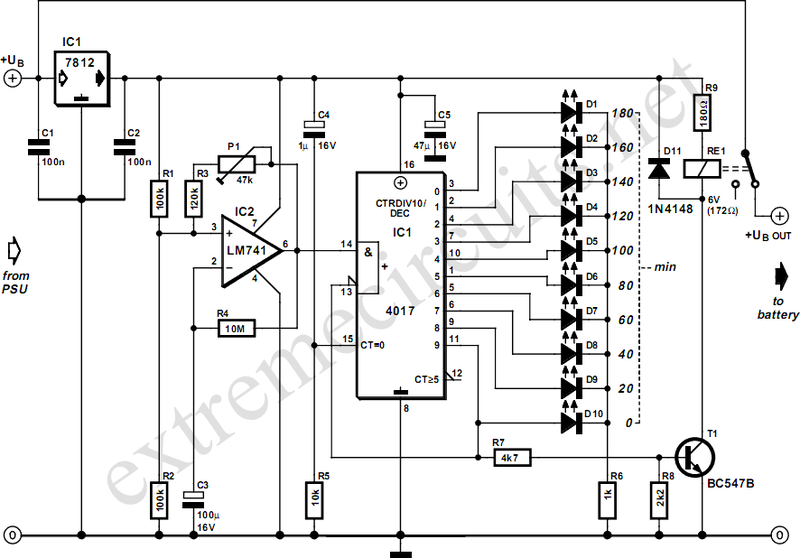 This circuit, which sits between the charger circuit and its battery socket, prevents that possibility: the contact of relay Re1 interrupts the charging current when the three hours are up. Ten LEDs show the remaining charging time in steps of 20 minutes. The timer is reset each time power is applied and it is then ready for a new cycle. When power is applied IC3 is reset via C4 and R5. 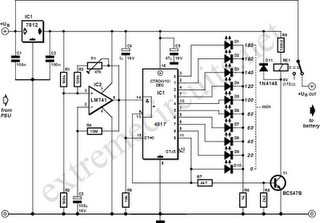 When the charging time has elapsed, Q9 (pin 11) goes high, which turns the relay on and interrupts the charging current. Since Q9 is connected to the active-low EN (enable) input, the counter will now remain in this state. The charging time can be adjusted from about 2 hours 15 minutes to 4 hours 30 minutes using P1. The author set P1 to 30 kΩ, giving a charging time of 3 hours 7minutes. The greater the resistance of P1, the shorter the charging time. The timing of the circuit is not particularly precise, but its accuracy is entirely adequate for the job. When adjusting the charging time it is worth noting that the ﬁrst clock cycle after the circuit is turned on (from Q0 to Q1) is longer than the subsequent ones. This is because initially capacitor C3 has to be charged to around half the supply voltage.